In all my years involved with this great sport of ours, nothing gives me more pleasure that to be at the airport when a team comes back home from international duty with medals around their necks. So there I was at Edinburgh this evening to see our teams back from the World Junior Championships in Vancouver. Not all have come home - Eve Muirhead and Isobel Hannen are on their way to Korea for the Mount Titlis World Women's event. However, here are the others, tired yes, but looking great after their trip. 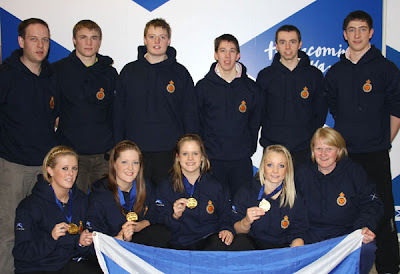 Back L-R: Alan Hannah, Graeme Black, Thomas Sloan, Steven Mitchell, Ally Fraser, Glen Muirhead. Front: Kay Adams, Sarah Macintyre, Vicki Adams, Anna Sloan, Rhona Martin. Graeme Black, skip of the boys' team, was still disappointed that his team finished in seventh equal place, but he has learned much from the experience. And of course Scotland's junior men have a place at next year's event in Flims. All the team were full of praise for the girls who captured the gold medals. And here are four of them: Kay, Sarah, Vicki and Anna. A lot has made made of the fact that Eve Muirhead has won three gold medals at consecutive World Championships - the skip after all tends to get the attention - but let's celebrate Sarah's achievement tonight. 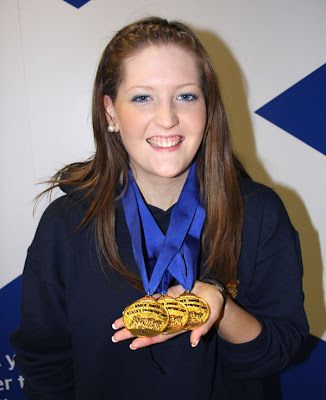 The Strathclyde University student has three golds too, from Eveleth, from Ostersund and from Vancouver. Many congratulations Sarah, it is quite an achievement and makes all members of the front end union very happy! 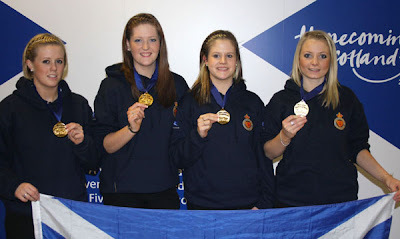 Well done girls and good luck to Eve and her Ladies team in Korea! !